Our Spring Menu has arrived, and below are some sneaks for what is to come! We have a ton of Dairy - Free & AIP friendly options on this list, and we can't wait to launch them all! Tell your friends! Enjoy! This week we are highlighting Eatology Saff Member, Shelby's, favorite meal! "The sauce + burgers together are one of the most uniquely flavorful things we have on our menu! 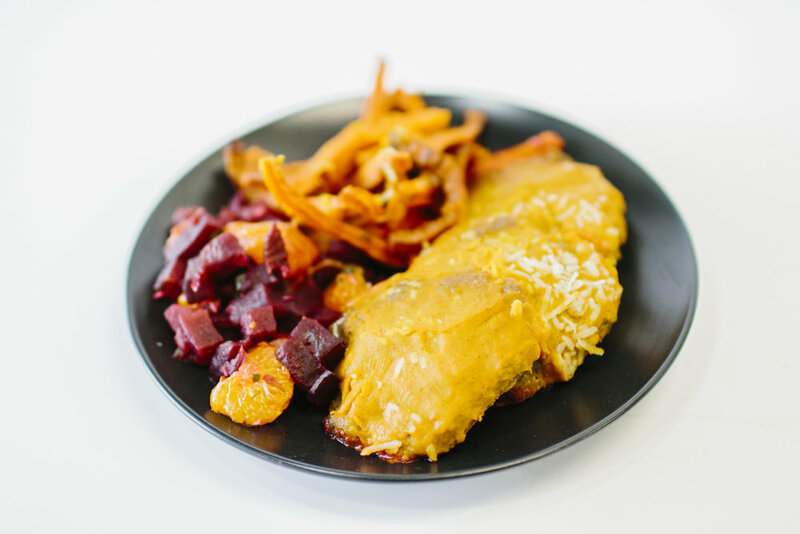 And who doesn't love a good sweet potato fry?! The beets are good too, but you HAVE to mix them in the sauce. It's the best!" Try out these flavorful burgers today by coming into our store, or selecting them on your menu this week! From everyone at Eatology, we hope you all had a Merry Christmas and a Happy New Year! If you, like many others, have the resolution to get healthy... We are your answer! Eatology makes it so easy for you to eat healthy because our food is delicious & so simple to heat up! If you think you're going to be missing good southern cooking (amongst your other favorites), THINK AGAIN. Today we would like to share with you: A Southern Duo. Indulge In our Rooster Skillet Scramble with Fajita Veggies for Breakfast and Shrimp & Grits with Rosemary Carrots for Lunch or Dinner! We love these two meals and you and your body will too! We are back and sharing some of our very favorites from our Holiday Menu this week!! 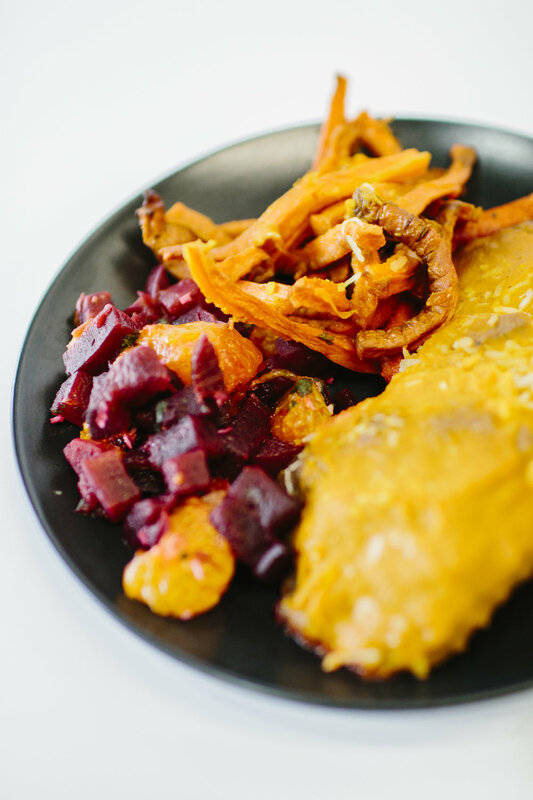 -Bake sweet potato for 40 minutes or until a fork slices smoothly. When cooled, smash the quarters using a large mixing spoon into a chunky sweet potato mash. - Mix section 1 and allow cooling. -Slice the eggplant in half long ways. Slice again into ¼ inch slices until all the eggplant is prepped. -In a large baking dish, spread ½ of sweet potato. Layer with eggplant slices, ½ meat mixture and ½ sauce. Repeat again. Bake for 30 minutes covered and 10 minutes uncovered. Fork should slice easily through Moussaka. There is a serious issue in our American culture regarding food, and it’s not the obvious issue of eating unhealthy food in excessive proportions. This issue is less noticed and less often addressed. It is the fact that we eat in a rush and in solitude. It is not only important to be conscious of the food we put into our bodies, but also, the manner in which we put that food into our bodies. We should eat with others and take our time while doing so. We must set aside time to truly enjoy the meals we eat. Doing this is so fundamental to healthy eating that even if we are eating completely unhealthy, there is still some benefit to be gained by taking our time while eating, and eating with others. Although the type of food we consume is important, eating healthy is not the sole criteria for eating well. As I mentioned in my previous article, there is a strong connection between the body and the soul and, therefore, a strong connection between the food that we nourish our bodies with and the condition of our soul. Our soul, specifically, the mind, which is a part of our soul and is our capacity for rational and insightful thought, is effected by our bodily wellness. Now I want to take this connection between eating and the condition our soul even further, beyond the fact that the food we put in our body effects our minds ability to perform. We can improve the condition our soul not only by the food we consume, but by how we consume it. There is a spiritual benefit that food provides, but that also the act of eating itself provides. The act of eating can be a way for us to truly connect with others by giving us the opportunity to talk, laugh, and interact with them. This is boundlessly healthy for our spirituality because humans have been designed by God to long for and need community. All people want to be in community with others because God instills in us the inherent desire to love others and to be loved by others, and we can only experience this by being around others. Regardless of the personality type that we have, even if we introverted or timid, we all still long for community because we all want to experience love. Even those who prefer seclusion at times, still have the desire to leave isolation after a while to be with others for no person always wants to be alone. The inherent want to be loved and to be loving towards others is the reason we desire friendships, to be a part of a family, or to have a spouse. We are happier when we are loved and, although we may have selfish temptations, we are also happier when we perform selflessly loving deeds. The table is a wonderful time for us to interact with others, and is thus a great venue for expressing love. Spirituality is the means or the method of becoming more in tune with God and with the knowledge of what is truly good for us, which are both related as God wants what is truly good for us. Eating is a spiritual action because, depending on how we eat, it can be truly good for us beyond the bodily sense. Because Eatology wants to cultivate healthier spirituality and improve souls, this company encourages you to eat with others and allocate sufficient time to do so. Avoid fast food, eating in the car, or scarfing down breakfast because you are in a rush. Although Eatology meals are pre-prepared to save you time in the kitchen, the goal of Eatology is not to save you time at the table. Pull your Eatology meal out of its foil container, plate it on a dish, and sit down with your family and friends while they are eating their own food. There is so much love to be had at the table. Lastly, we have our Chipotle BBQ Meatballs w/ Squash Casserole! o Place all ingredients, except avocados and lettuce, in a slow cooker and cook on low for 5 hours. o Remove the chicken, shred with two forks, then return to sauce for an additional hour. o To serve, place 1 ounce chicken and 1 tablespoon avocado in a lettuce leaf for a 1B taco. Our Holiday menu is HERE, and we are excited! Over the next couple months, we will be releasing meal highlights every Thursday featuring our holiday food! To start, we have some awesome dishes! First up, our Pumpkin Spice Chicken Cacciatore with sweet potatoes & Green Beans! Next, our Cinnamon Apple Spice Chili with Broccoli! YUM! And to end with a bang, our Pumpkin Espresso French Toast Sausage with a Cinnamon Sweet Potato Hash. This dish is so flavorful and is the definition of fall! Stay tuned next week to see more holiday Eatology meals! "Thank you again for changing my life. I could not be where I am today without the education and knowledge you provided us to succeed." Thank you again for changing my life. I could not be where I am today without the education and knowledge you provided us to succeed. Since I began this journey in December 2015 I have lost 35 pounds. I recently run in my first 10 K in September and this weekend I am running with a team in a relay marathon. I still can't believe how far I have come in the last year. Looking back at photos in 2014 when I was pregnant with my youngest I was 65 pounds heavier then I am right now. Thanks again for everything. "I LOVED my first order. I'm on the national tour of Phantom of the Opera and I am living out of hotels all across the country. I was tired of not being able to find healthy options for food so I started googling paleo delivery services. I did a lot of comparing and you guys were the best option for me, so I placed my first order. So glad I did, it's nice coming home after the show and having good food waiting for me." We are created by God with different elements to our being, and we must strive to perfect all of them, and that is the reason I promote Eatology Paleo-Zone. Eatology’s goal is the perfection of the entire being of the human person. Yes, food is for our bodies and Eatology serves food, and so your first impression might be that Eatology cannot possibly strive to improve our entire being, but that is not the case. The mission of Eatology is to perfect our entire being by starting with perfecting our bodily health through the means of food. This company believes that the pursuit of perfecting our entire being is aided by perfecting our physical health. In fact, it is quite difficult to perfect any single aspect of ourselves unless we are striving to perfect every aspect of ourselves, which is the reason good health is so crucial. Our body and soul all function smoothly and gracefully together, each depending on the other to thrive and to flourish. These aspects of our being are interconnected and intertwined so that they cannot stand alone, and so that together, they are a complete and single entity, which we call a human. Eatology sets out to nourish this entire entity.Think about it, how difficult it is to focus on anything or exert yourself intellectually when you feel famished or when you feel horrible from something unhealthy you ate? Our ability to think rationally and intellectually is part of our soul. This scenario wonderfully illustrates how a certain aspect of our being depends on another to function to its greatest capacity. It is more difficult for our mind to perform at a higher level when our bodies are not functioning well. It is almost futile to focus on our work when we feel physically awful. -Pre-heat a grill pan over medium-high heat. -Place mushroom caps on the grill pan, grill side down, for about 3 minutes until soft. Sauté apples until soft then add chicken to heat. -Flip caps and season with salt and freshly ground black pepper. Spread a spoonful or so of roasted red pepper paste over the mushroom cap in a thin layer. -Top with hot chicken, apple and mozzarella cheese and tent with foil to melt. For a 2B portion, this will serve 13 meals and 8 meals for a 3B portion. 1. Heat oil in large heavy bottomed pot. Add onions; sauté until translucent and bell peppers. Add bay leaf. 2. Add garlic, stir for 30 seconds until fragrant. 3. Add beef, brown evenly. 4. Add spices, tomato products, stock and water. Mix well to incorporate. 5. Allow to simmer uncovered for 2 hours. Add vinegar, taste, and adjust spices as necessary. 6. Garnish with diced avocado and chopped cilantro if desired. Enjoy! "The food is fantastic and I can't stop bragging about it. I am a single professional and paleo zone prepping is so hard and can get quite boring... You and your team are a dream come true!" The food is fantastic and I can't stop bragging about it. I am a single professional and paleo zone prepping is so hard and can get quite boring... You and your team are a dream come true! I actually found you on a blog listing Austin's top paleo food delivery services (I have been searching for a while).